Cody recently reviewed the .5mm Pentel EnerGel, a pen that is in the Top 3 favorite pens for both of us. In my recent order from JetPens I ordered the .35mm version to try something a bit different. I've never used a 0.38mm tip that I had really enjoyed before. I was a bit tentative going into this review, but I was pleasantly surprised. The 0.35mm wasn't scratchy at all! I really couldn't believe it when I took off the cap and started writing away. The line is a bit narrower than the 0.5mm pen which is to be expected, and is a nice change of pace. For my particularly messy form of handwriting the narrower tip keeps things organized a bit better, which helps the legibility. The body of the pen is exactly the same as the 0.5mm version. 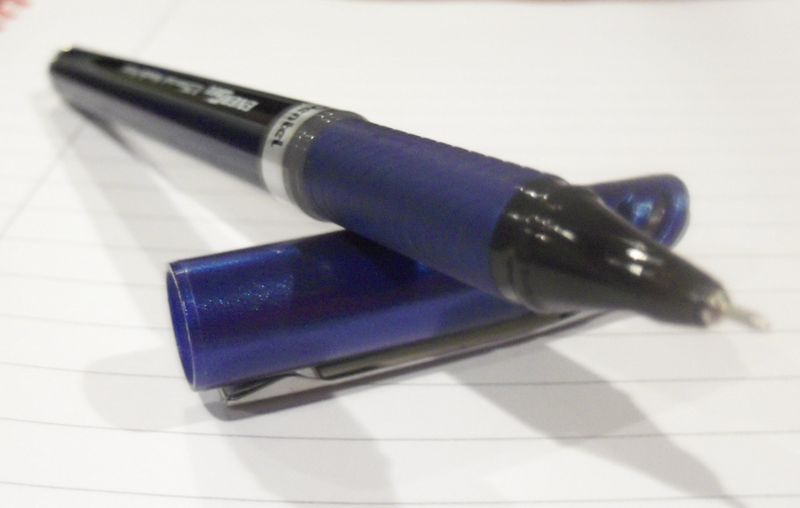 The body of the pen is a shiny metallic blue with a metal looking plastic clip. The overall design is solid, although the blue body and black ink can be a bit off putting. 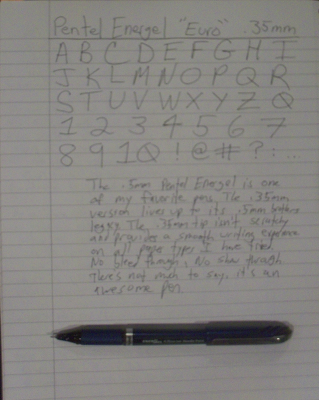 This is the one thing that bothers me about the EnerGel, why can't a black pen ink have a black pen body?. The cap posts on the back with a very satisfying click and stays firmly on the rear of the pen when writing. The grip is unchanged from the 0.5mm version and just as stellar. I didn't think that a pen could be better than the 0.5mm Energel, but the 0.35mm has surpassed it. I have actually switched to using the 0.35mm as my go to pen. If you are worried about trying a sub 0.5mm pen tip this would be a great pen to start with. The tip is not scratchy and glides across the paper. It is a great introduction to micro tip pens, and a great addition to any writing arsenal. Oooh I love the 0.5.. I'll have to pick up a 0.35 to try out!